This is what my yoga teacher says and it usually goes in one ear and out the other. But this month I’m taking her advice, jumping on the bandwagon and trying to embrace the Danish concept of hygge. This involves attempting to create a general vibe of relaxation and wellbeing i.e. lighting lots of candles, cuddling up under warm blankets, drinking warm drinks…eating stews. I’m relaxing my punishing exercise regime (which sometimes enters the realms of self harm), letting some dust build up, and trying to ignore my ‘to do’ list. I am also NOT having a dry January. This recipe for warm, spiced milk, slightly sweetened with honey encapsulates the feeling that I’m trying to achieve. Although you may argue that hot chocolate laced with brandy would be better. Waterstones was packed with books about hygge over Christmas and so it’s not surprising that I received one as a present. I really enjoyed reading it because it was entirely readable and intellectually unchallenging – which in itself is very hygge (have I annoyed you with my italics yet?). My honest view though is that we already have a perfectly good English version of this concept – it’s just that our word for it is ‘cosy’. An open fire, a cup of tea, a good book – who doesn’t love that! This is a very good article on the matter but it is not short so you will need a good attention span and at least 15 minutes spare to read it (The hygge conspiracy). Bash the cardamom pods in a pestle and mortar and put them into a small saucepan with the milk, turmeric and cinnamon. Heat gently until almost boiling. Strain into mugs and stir in the honey once it has cooled a little. NOTE: I’m cooking meatballs in gravy tonight from a Tom Kerridge recipe. I’m hoping that this will supply further comfort and feelings of wellbeing. If they’re good I’ll post the recipe here next week. I’m just trying to decide whether to have them with mashed potatoes (the obvious accompaniment) or chips (what I really want!). We have beetroot coming out of our ears. This is great news, but after using it in all our best-loved beetroot dishes (borscht, Russian salad, my husband’s legendary pink risotto) we are running out of ideas. So this week I’ve been experimenting with dressings for cold, roasted beetroot so that we can have it on its own for lunch, or on the side with any old meal. So far this is my favourite. The flavours of cumin and lime are fantastic with the sweet beetroot. For the roast beetroot, first cut off the leaves and trim the root, then scrub to remove as much dirt as possible. Place in a baking tin, cover tightly with foil, and bake in an oven heated to 160oC for 1 1/2 to 2 hours. The beetroot is cooked when a skewer goes all the way through without resistance. Leave to cool and then slip the beetroots out of their skins and chop into small chunks or thin slices. For the dressing, first dry fry the cumin seeds in a small frying pan, without oil, over a high heat for about 30 seconds until brown and fragrant. Crush in a pestle and mortar with a good pinch of coarse sea salt. Add this mix to the other ingredients in a small bowl and whisk together. Spoon over the roasted beetroot and serve. 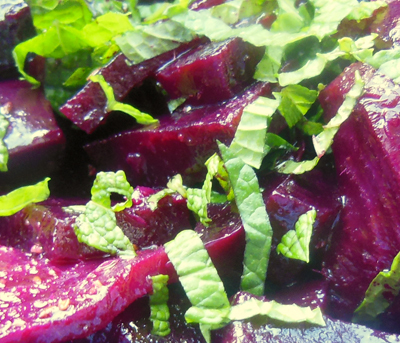 NOTE: This beetroot salad goes really well with brown rice and flaked hot smoked salmon. I’ve been meaning to make baklava for months and I spent so long dithering and researching recipes that when I came to make it I completely bamboozled myself with the options. I’m amazed that everything ended up OK because in the end I cobbled together a recipe by taking bits from Nigella, Jamie, Felicity Cloake AND the recipe on the back of the filo packet. If there’s one thing I’ve learnt in my 37 years it’s that you should get on and face the things you fear because most of the time they end up not being so bad after all. Making baklava was a case in point. I put off making it because I thought it would be tricky but it was actually pretty straightforward. You could easily tinker with this recipe to get it just to your liking. You could vary the mix of nuts depending on what you have to hand/what you like/what you can afford. And if you don’t like too much spice then it’s not necessary to include as much/or indeed any cardamom, ground cloves or cinnamon. I didn’t have a sweet tooth until I breast fed my children but I developed a sugar fixation then which has never left me. Just a tiny square of baklava is usually thought to be enough but I think I could easily eat several pieces in one go – no problem. Preheat the oven to 160oC. First chop the nuts. I did this in a mini food processor. Don’t over chop so that they’re like dust, it’s nice to have some larger pieces for bite. Put the nuts in a bowl and add the cardamom, ground cloves, cinnamon, orange zest, salt and mix well. Line a deep baking tray 24cm by 34cm and at least 4cm deep with baking parchment so that it comes up the sides of the tray and butter liberally. Unwrap the filo pastry and trim to the size of the baking tray (I used scissors to do this). Put one layer in the bottom of the tray, then liberally brush another filo sheet with butter and put this on top as lightly as you can. Repeat until you have used four sheets and then spread over half the nut mixture. Now butter and layer up four more filo sheets, then add the remaining nuts and top with four more sheets of filo (buttering in the same way as before). Cut into squares or diamonds as neatly as you can with a sharp knife. My technique needs some work (I tried following Nigella’s instructions for traditional diamonds, in her book ‘Feast’, but I think I might do simple small squares next time). Meanwhile make the syrup by adding the sugar, water and lemon to a small pan, heat over a low heat until the sugar has dissolved then turn up the heat to medium and simmer (without stirring) until the syrup thickens (10-20 minutes, for me it was more like 20). When an hour is up take the baklava out of the oven and turn up the heat to 180oC. Pour over the syrup being particularly liberal along the cracks and drizzle over the honey (again putting more down the cracks). Once the oven has come up to temperature put the baklava back in for just 5 minutes. Leave to cool completely before prizing from the baking tray and storing in an airtight container. 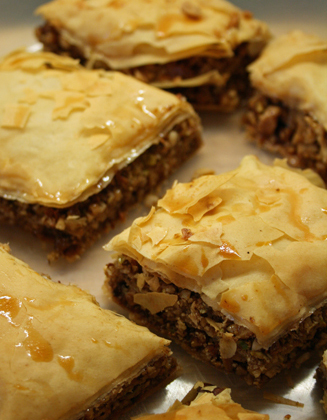 I think baklava is best after a couple of days (if there is any left by that point). I’ve not been a great success in the kitchen this week. First of all I made a custard tart but there was a tiny crack in the pastry case and the liquid filling ended up pouring out all over the oven. I’m usually calm in the face of adversity but on this occasion I swore and stamped my feet like a frustrated child. Then I tried to make meringues. I’ve had some past success with a Peyton and Byrne recipe so I used this and did all the things generally recommended for success (clean bowl, no yolk in the white etc, etc) but they collapsed and ended up as a single flat disk (just about edible but only one step removed from eating an actual sugar cube). 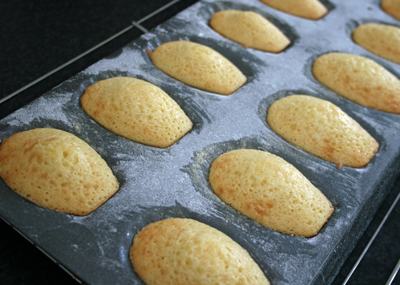 After these disasters I needed something easy-peasy to calm me down and restore my confidence so I turned to this madeleine recipe from Raymond Blanc’s very 90s book ‘Cooking for Friends’. They don’t wow on the looks front even though they’re cooked in a fancy shell shaped pan, but they have a simple, sweet, buttery taste which is just lovely. They are also tiny so you don’t feel too guilty about popping one in with your coffee or feeding them to your children. It’s nice to have the proper tin but to be honest the shell pattern on my one isn’t that pronounced. If you don’t have a madeleine tin then you can just use a regular 12 case jam tart tin. Raymond says this makes 35-40 pieces but it makes two batches of 12 in my Lakeland madeleine tin. First prepare the tin. Brush with plenty of melted butter, sprinkle on some flour and tap off the excess. Beat together the eggs, sugars, salt and honey until smooth in consistency. Fold in the flour and baking powder, then add the melted butter and mix until well blended. Half fill each hole in the tin with the mixture and cook for 5-7 minutes in the oven or until just cooked through. Take out of the oven, remove from the tin immediately and cool on a wire rack. You may find this post both patronising and hypercritical if you read the one I wrote a while back criticising Jamie Oliver for including a fish finger sandwich in his recipe book. But I’m posting this recipe because my daughter Elizabeth loves porridge and I would like my way of cooking it to be written down so that she can make it the same way when she’s a big girl. And remember, you don’t have to fork out £20 to read this blog. 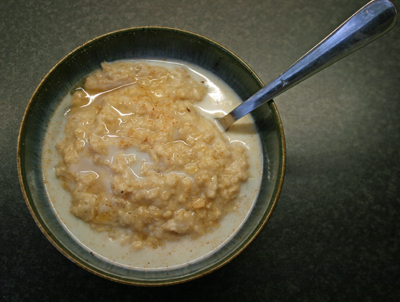 Porridge is often classed as poor food because it’s cheap. I ate it for two meals a day when I was a skint graduate desperate to live in London with an unemployed boyfriend to support and too much pride to go running to the bank of mum and dad. 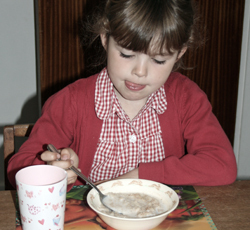 But even then I really didn’t mind eating so much porridge because, just like my daughter, I LOVE it. And now that money is not a huge issue but time is, porridge has become a real luxury for me. Most weekdays breakfast is a small bowl of muesli or a slice of toast eaten standing up whilst doing several other things, but when I can find time to make porridge I’m always pleased that I did. Here’s how I do it. Start the process the night before (remembering this is the trickiest bit). Measure the oats into a saucepan and soak in 450ml of cold water. Cover with a lid and leave overnight. This part is essential for a lovely creamy texture even though you are just using water. In the morning put the pan on a high heat until it just starts to bubble. Turn the heat down to medium and cook for about 3-5 minutes, stirring continuously so that it doesn’t stick. If you think the porridge is a little thick for your liking then you can just add a bit more water. Spoon into bowls and pour over 1 tablespoon of milk and add a drizzle of honey and some grated nutmeg. If you’re feeling really luxurious then you can use cream instead of milk which is delicious and an occasional weekend treat. NOTE: Providing you don’t use cream this is great diet food. It really fills you up and is only 256 calories per serving (oats 185 calories, honey 64 calories, milk 7 calories). Elizabeth enjoying her morning porridge.